Though the trade and energy corridor may be great for Pakistan, for China it is part of more motivated plans to beef up the country's global economic muscle. Chinese officials describe the corridor as the flagship project of "One Belt, One Road" policy, which aims to connect China physically to Asia, Europe and beyond. 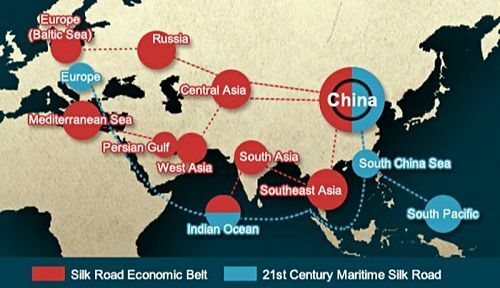 This initiative includes the New Silk Road, which will link China's market with Europe through Central Asia and the Oceanic Silk Road to ensure a safe passage of China's shipping by avoiding the Indian and the South China Sea. The corridor will provide China an alternative route to the Gulf region through the Arabian Sea. The cost efficient route will not only make it conceivable for China to grow its trade with African, Central Asian, and Middle Eastern markets but also with Iran. Chinese exports to Iran would become increasingly competitive and simultaneously, Iran is eyeing as much as $100 billion worth of energy deals in the future, and Tehran's abundant oil and gas reserves could find a growing demand in China too. It is all part of China's mission for influence throughout the continent via aid and investment. After decades of limiting itself from aggressive foreign policy, China now wants to play a much greater regional role and is pushing plans for interconnected infrastructure networks to link better its economy with rest of the world. On the other hand, China is increasingly worried about the domestic threat posed by the Muslim separatist group, East Turkestan Islamic Movement (ETIM) that is irritating countries establishment to create an independent state in the western province of the China. China believes that the group had found havens in Pakistan's tribal belt and the group is stimulating violence in the province of Xinjiang. Chines think that Pakistani transport routes will allow China to expand its economy in the western part Xinjiang, where ferocious attacks by ethnic Uighurs have risen severely in recent years. The investment could lead to increase in job opportunities in that region, laying a more diverse population that China anticipate could make it more difficult for groups such as ETIM to thrive. Western analysts also perceive the potential for China to become a dominant influence in keeping Pakistan focused on its struggle against terrorist groups. China hopes that the CPEC will enable oil and gas from Gulf to be piped through Balochistan over the Hindu Kush mountains into China. Chinese goods would have a much shorter distance to world markets as compared to the Malacca Strait, which China consider is at the mercy of American and Indian Navy. Balochistan's turmoil is also a reason to bring doubts in Chinese investment. Although Pakistan has promised 30,000-strong force with four layer security plane to protect Chinese workers; China, however, still worries. As there have been occasional kidnappings and killings of Chinese workers in Pakistan in recent years, including in Balochistan. Optimistic Chinese President Xi Jinping is confident and intent on extending China's influence in Asia, and understand that his country can avoid the old drawbacks and accomplish a new economic and political predominance in the region. Trucks carrying Chinese goods could soon start a 3000-km descent to a saltish and warm water Gwadar port, where the cargo will be put on ships bound for markets in Africa, the Middle East, and Europe. If China can export more of its merchandise along CPEC instead of the Malacca Strait, not only it will reduce transportation time to the world's fastest-growing markets but also China will be able to shift more of its manufacturing base to it's rural and remote, western provinces. Economic growth will help the poor region with weakening political unrest and cutting pollution in China's eastern cities. During the process, China hopes to accomplish somewhat the United States has been unable to do over the past decade: Improve Pakistan's economy to keep down poverty and increase job opportunities that will help to curb terrorism. - Who is behind Baluchistan's deadly unrest?